Angelo brought Moe Fleisher along. He was a guy who sold boxing shows from New York and was publisher of ‘Ring Magazine’. 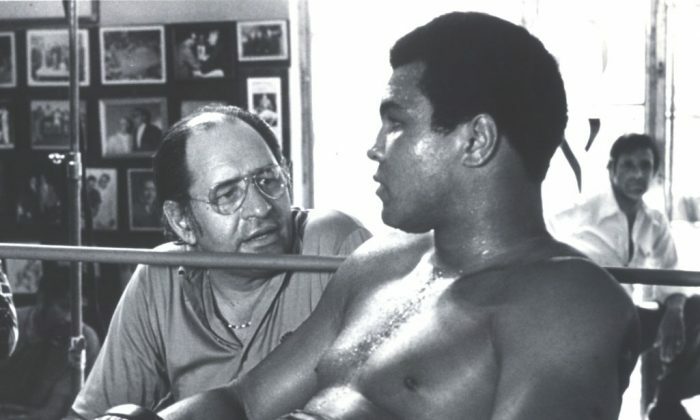 I met Angelo Dundee around the time I came to Miami to live. “I like boxing and jazz,” I told him. “Any boxer that gets cut I will sew him up for nothing. I will take care of his medical needs. For the rest of your life you will never have to write out a check for me. On the other hand, I want a ticket to every fight you promote—for me and my wife and maybe more if I want to bring friends.” He got a good deal. So did I. He saved himself at least a hundred, two hundred thousand dollars. For my part, because of Ali, worlds of interest opened up to me that I had never known. I met the Queen of England, Winston Churchill, Malcolm X, the Beatles, Elvis. Through the 1960s and 1970s, everyone who was anyone was at our door. They all wanted to be with Ali. I met Budd Schulberg. He liked being at the Fifth Street Gym. He loved boxing. He was a great writer, a perceptive writer. He wrote ‘On the Waterfront’, ‘The Harder They Fall’ among other top writings. I had written a very good novel of my growing up. It delineated the society of Tampa and Ibor City better than anybody else has ever written it. I asked him if he would read what I had written. We agreed that he would come over to my house at ten the next morning. He asked me to have a good bottle of vodka for him. I had a case ready. He went into the backyard with the manuscript, sat under the shade tree, and began to read. He stayed with me for two days and read it straight through. He edited it for me and did not make many changes. He said he liked it a lot and if it doesn’t get published, it will be a shame. However, he couldn’t get it published for me. I couldn’t get it published either. But Schulberg was extremely helpful to me, and I was extremely helpful to him. And that was because of Ali. Because I knew Ali, people wanted to know me, to help me.